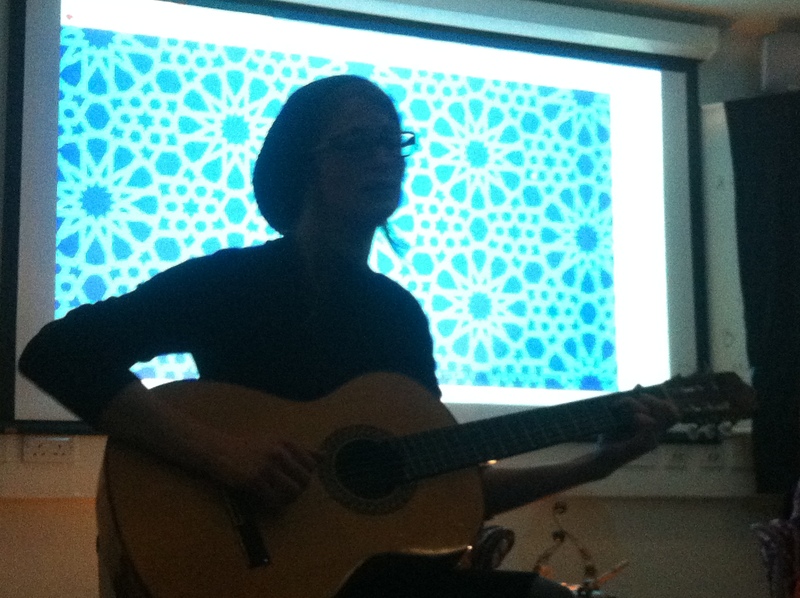 Back in London for the holiday season, the first thing I did was perform at the Salaam Café, organised by Rabia and Sakeena (aka Pearls of Islam) in aid of the Rabbani Project‘s fundraising campaign. 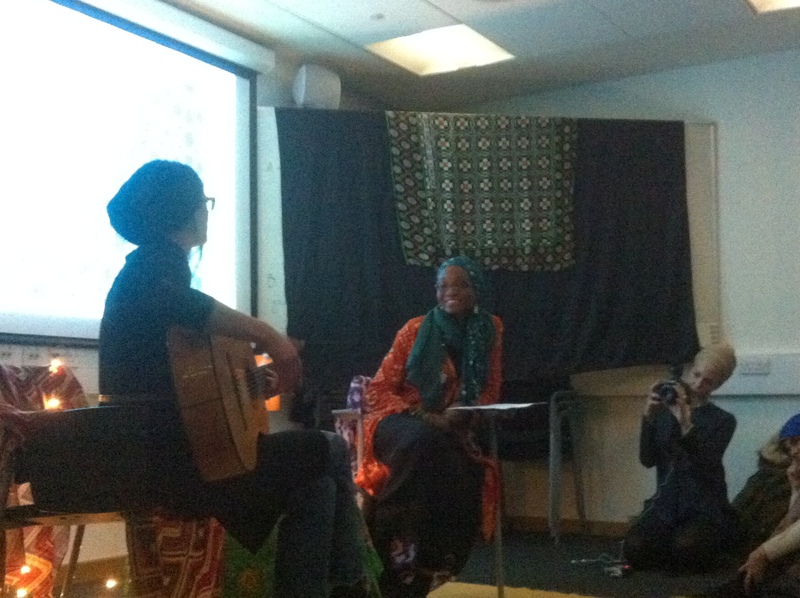 This particular installment of Salaam Café was held at SOAS, my old alma mater…I calculated that it had been 8 years since I’d been back, and the anarchic feel had largely been replaced by a more sober, grown-up air of studiousness. The bathrooms even had sensor taps for people so gripped by their anthropology textbooks they didn’t have time to turn the taps on and off. But a number of things have held me back from devoting myself to music properly over all these years. One, in purely practical terms, is that my son puts his fingers in his ears every time I start playing guitar. Not the best encouragement, though I try to stand my ground and not resort to playing Postman Pat in order to appease him. Likewise, even though night-time might be the right time for some stringed instrument loving, my daughter has the nocturnal sensitivity of a fruit bat and wakes up yelling loudly if I raise my voice over a certain volume. So for a long time now I have relegated music to something I did when the kids were away, a guilty pleasure I indulged in during childcare hours when computer work bored me stiff. Now, with them away for Xmas, it feels like I can address music the way it deserves to be addressed: in the first person, as my lawfully wedded partner, and not the bit-on-the-side I’ve shamefully viewed it as. Another lurking niggle has been the whole issue of music in Islam – more specifically, the prohibition on girls singing in taverns. Having played music in various pubs and bars, I can vouch for the unpleasantness of singing out your heart and soul for a bunch of people either too woozy to take in what you’re saying, so over-enthusiastic you can’t take their reactions seriously, or busy vomiting into someone’s cleavage. Now, I don’t generally listen to any Muslim authority figure who harangues, wags fingers or can’t remember how to smile; it flies in the face of the Prophetic example of having good manners and speaking with kindness and smiles. Yet their rhetoric can get stuck in the back of the head. Hard-line Muslims will argue that “Anything that leads to bad is bad”. I don’t even know where this statement emerged from, but just running it through some basic logic it becomes clear that at the very least, it cannot be universal. Let’s take driving, for example. Travelling by car is the most dangerous form of transport on the planet; an estimated 1,240,000 people died last year worldwide. Killing a pedestrian, your passengers (usually your own family) and/or yourself surely qualifies as something that is ‘bad’. Yet we do it most days without thinking. On the other hand, a good deal of ‘good’ happens as a result of vehicles travelling around the place. In fact, one ambulance alone can save over 4,000 lives every month, while in 2012 only 1,475 people died in the UK in traffic-related deaths. That’s a rather delightful ratio of potential good versus potential harm. By comparison, listening to a song doesn’t cost a penny, pollute the environment OR contribute to political instability in the Middle East. It’s a win-win situation! From a Sufi perspective, everything has the potential to lead to good, depending on how we handle it – otherwise it wouldn’t have been manifested by the Most Compassionate. 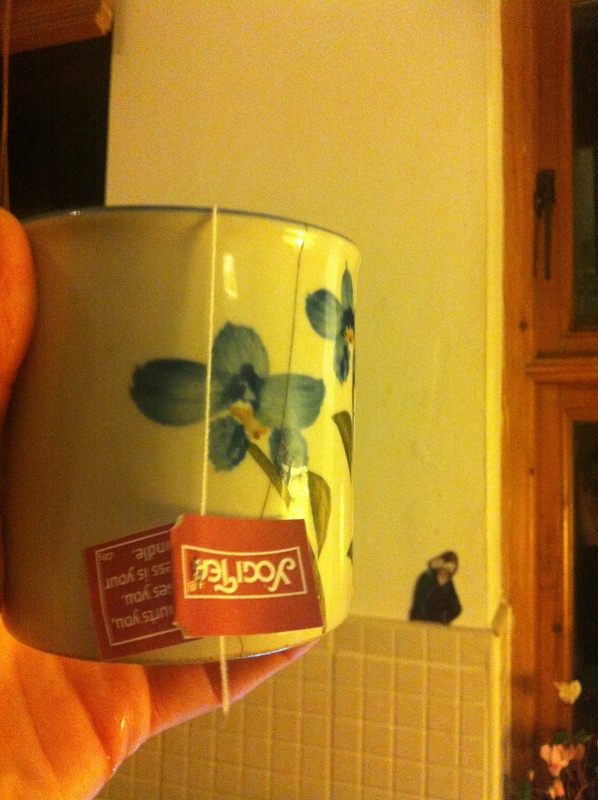 As my Yogi Tea aphorism put it today: ‘What hurts you blesses you. Darkness is your candle.’ Thankyou, O Sweet Chai guru. So the (somewhat tired) argument that music leads to ‘bad’ (music videos that degrade women, musicians bloated on glory and money, glorification of drug use etc. etc.) has to be balanced by the good that it can lead to (enjoyment, relaxation, healing, bringing people together, gainful employment for deserving skint people, etc. etc.). More than any of this ideological browbeating, however, my most compelling excuse for giving up on music (albeit temporarily) was the sudden lurch from joy to despair that always seemed to happen after a concert. The thrill of being warmly received bottomed out almost immediately off stage, replaced by a deep disgust with myself, a complete loss of self-belief, and a feeling that this really wasn’t good for me overall. 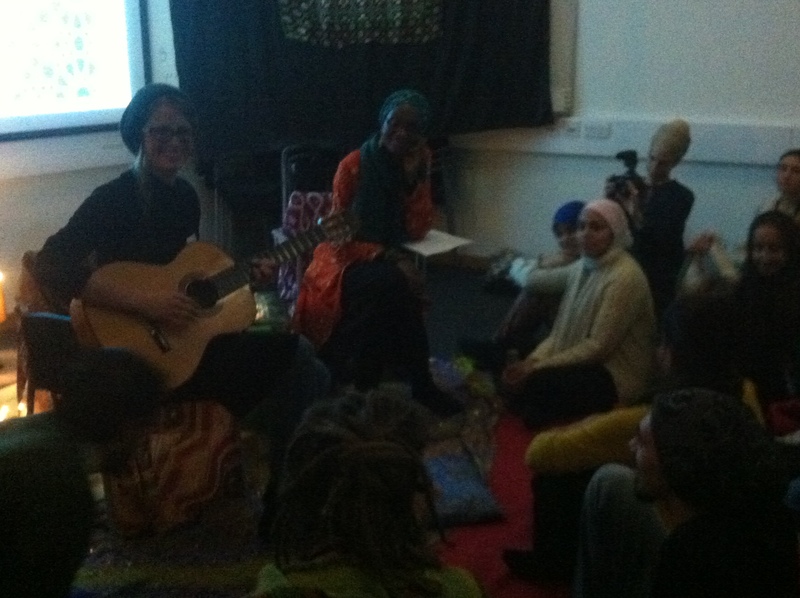 But reintroducing music into the Sufilicious environment that I was introduced to it in (having started singing Andalusi and North African qasidas as a child at the dhikrs our families went to), this whole dimension of performance has been transformed for me. Instead of feeling elevated into some kind of momentary idol and then dropped from the height of my inflated ego and smashing into smithereens, the joy I am not only feeling within but also feeling reflected back from the audience is now merely a trope for the love of (or from?) the Divine that unites us. It’s what makes me want to sing in the first place and what makes them inclined to listen. The stage and the crowd overlap, and the afterglow is real and lasting. Just in case anyone hasn’t got the message loud and clear, music has a tangible, cellular effect on the body. It changes us – for better or worse. I spent many, many nights alone in my attic room as a teenager, hugging the child-sized guitar that resonated against my chest and brought it out of numbness and back through pain and into joy again. The classical Islamic world was full of hospitals in which orchestras would play healing music to invalids. Certain kinds of acoustic music, such as West African kora music or cante jondo flamenco, has a tremendous power to affect my emotions, while bopping like a lunatic to trance changes my heartrate so swiftly that the novelty quickly wears off. Cuban salsa and Brazilian samba get me dancing for joy, as does Congolese rumba. South African gospel fills me like a sail. Bulgarian choral music sends me to a strange alternative universe of harmony and dissonance. The relationship between art and pain is so well documented it has become easy to view it as myth. You can study how to write songs or poetry, after all, and being a professional means getting the job done, not waiting for inspiration to spring out of suffering. Yet the bond is still there, indestructably. Art in whatever form will always be the artist’s favourite way to self-medicate. And it’s not just a drug to numb the symptoms while corroding the taker’s overall health: it’s medicine. Any bitter side-effects are just a sign of the cure about to occur. 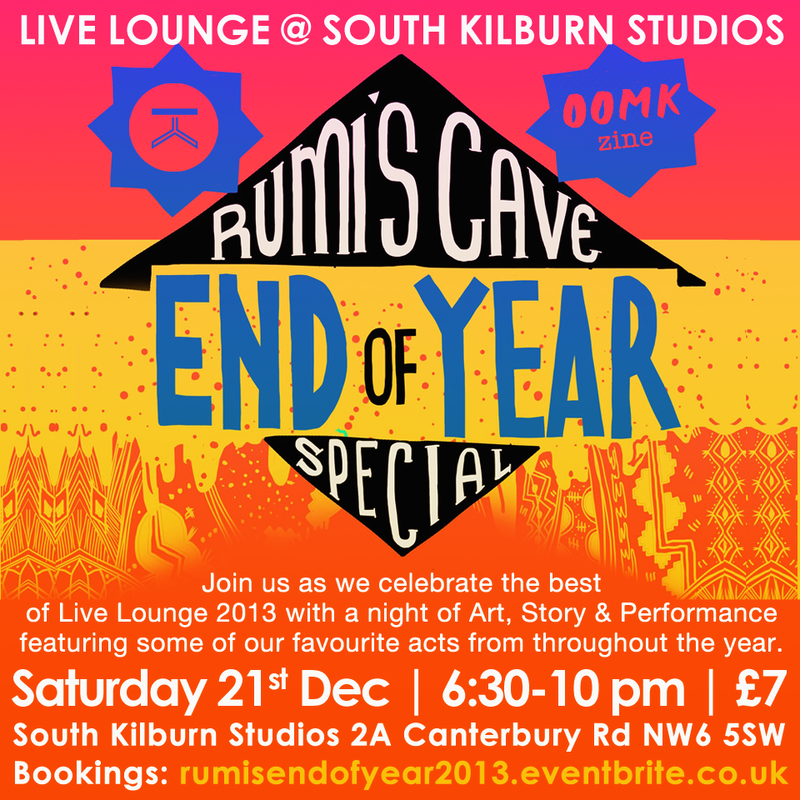 For those readers who are in London at the moment (or who can easily get there), I’ll be performing again this Saturday at South Kilburn studios as part of the Rumi’s Cave end-of-year fest. In the meantime, I have promised myself not only to write a poem at day (even if it is crap), but also to give some serious time to music, and even – inshallah! – get a satisfying amount of recording done on my new album. As Rumi said, ‘There is no grace without discipline’. See, now I have no excuse. You have my permission to chase me up about it. In the meantime, I wish you all a joyous Christmas, complete with chestnuts roasting on an open fire – and not a double entendre in sight.